Message boards : Number crunching : more workloads. Hello. i set my configs in boinc to store 10 dys of work and an additional 10 days of work.. but i go thru it in about 1:30h's... minus a few CPU task that might then most of the day. but that still just one day. i have it set to 20.. what gives? Message 68147 - Posted: 12 Feb 2019, 10:11:27 UTC - in response to Message 68145. There are server side limits on how many WUs you can have on your computer: Micromanaging CPU vs GPU Workunit Limits. Also it's not a good idea to have 20 days of work stored on your computer, when the deadlines here at Milkyway are just 12 days. 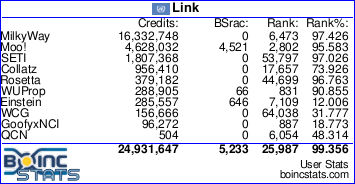 If you could get that many WUs, your BOINC client would abort many of them, since it wouldn't be able to start them before the deadline.